Stills and print (c) Jason N. Parkinson 2010. All Rights Reserved. 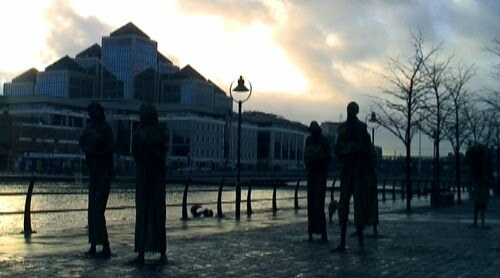 Statues depicting 1845 famine victims on North Quay in Dublin. Wednesday 17 November: This morning the Irish government will hold meetings to decide if they will accept the IMF economic bailout. The Irish economy, known for ten years as the Celtic Tiger, faces extinction. Massive cuts have hit public services, health and welfare. Unemployment stands at 455,000 in a country of 4.5 million, poverty is on the rise and vast estates of new homes built during the economic boom lie empty like 21st century ghost towns. Public protest is also rising, as is the anger, after the government publically declared their annual EU cheese aid program was evidence they were taking measures to combat the economic decline. In May protestors attempted to storm the Dail and on Wednesday 3 November Garda riot police attacked a student sitdown and occupation protest with batons and dogs, similar scenes were reflected a week later in London. Please contact Report Digital or the AUTHOR for access to this material and the extensive five-year video archive.